The Perth Mint’s Year of the Monkey coins are ready for release with an all-new design and various weights for investors and collectors to choose from. 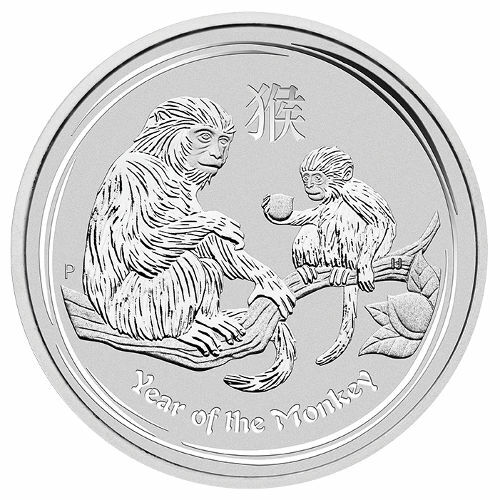 Part of the Lunar Series II program from the mint, Year of the Monkey coins are one of the most popular bullion coins produced each year. 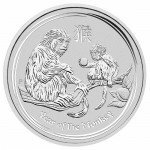 Right now, the 2016 5 oz Silver Australian Monkey Coin is available on Silver.com. Each coin ships in an individual acrylic Perth Mint capsule. Face value of $8 (AUD) is fully backed the Australia’s government. All-new 2016 imagery on the reverse represents the Year of the Monkey. Silver Australian Monkey coins are available from the Perth Mint in bullion and proof versions, with a total of seven different weights. The largest coin in the series is the 10 Kilo coin, with an extremely limited mintage of 150 coins. The only other coin in the series with a limited mintage is the 1 oz variety, while the 2016 5 oz. Silver Australian Monkey and all other weights will be struck to meet demand. The Year of the Monkey covers those born in 1908, 1920, 1932, 1944, 1956, 1968, 1980, 1992, 2004, and now, 2016. Individuals born under the sign of the monkey are said to be curious, quick-witted, and ambitious. Of course, there are negative aspects to these traits such as mischievous behavior and a tendency to harm others. 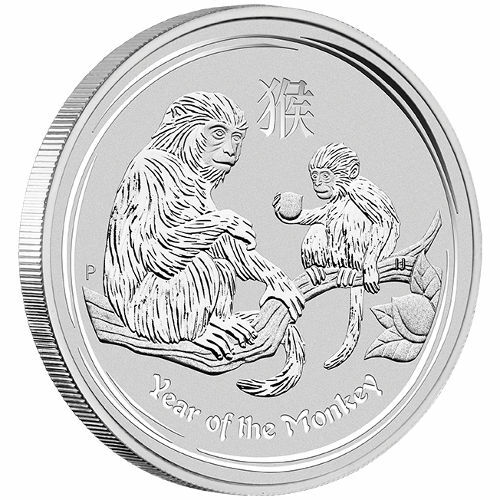 On the reverse side of the 2016 5 oz Silver Australian Monkey is the all-new Year of the Monkey design. The image of an adult monkey and young monkey sitting in a peach tree, with the younger holding a peach in its palm, is said to be symbolic of longevity and immortality. The obverse side of the coin features the right-profile portrait of Queen Elizabeth II. 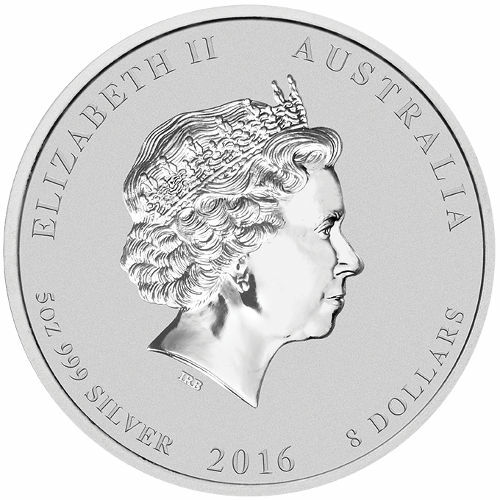 Though this fourth-generation image of Her Majesty is outdated as of July 2015, the Perth Mint continues to use it for the sake of consistency on its Lunar Series II coins. Each coin in this listing is in Brilliant Uncirculated condition. A BU coin has no signs of wear and tear, but may show breaks in the luster, spotted surfaces, or contact marks from the striking process. Feel free to contact Silver.com at 888-989-7223 with any questions. You can also connect with us online using live web chat and email services. If you are looking for similar products, be sure to check out our selection of Silver Perth Kookaburras.